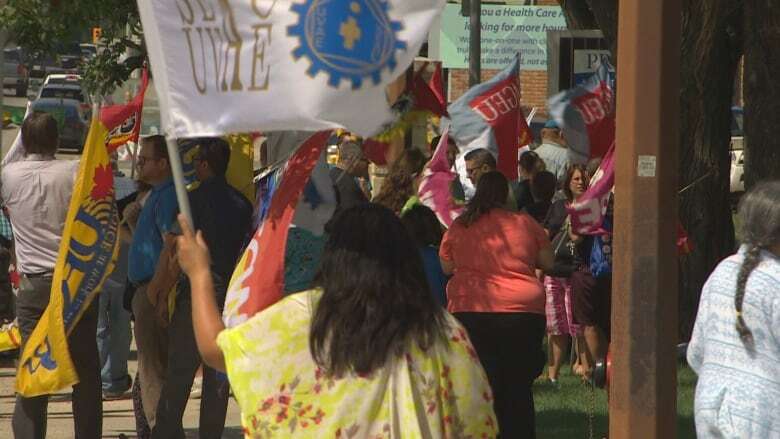 A few dozen workers rallied outside the Deer Lodge Centre Wednesday, calling on the province to reverse a bill that will reduce the number of collective agreements in health care. The Public Service Alliance of Canada, the union representing federal public service workers, organized the protest in response to Bill 29 — The Health Sector Bargaining Review Act — which reduces the province's 183 bargaining units to seven per health region and employer. The new bargaining units are broken down by job. "What they're doing essentially is forcing unions into votes to fight against each other for members," said Marianne Hladun, executive vice-president of PSAC in the Prairie region. She said the Manitoba Federation of Labour, in partnership with several unions, had proposed a bargaining council where all unions would work together with the government to negotiate a single collective agreement, but that proposal was ignored before the province passed Bill 29. "We're calling on this government to repeal Bill 29 and let these members stay with the union that they chose many, many decades ago," Hladun said. The majority of health-care workers at Deer Lodge Centre, a hospital for veterans created by the federal government, belong to the Union of Veterans Affairs Employees, a component of PSAC. 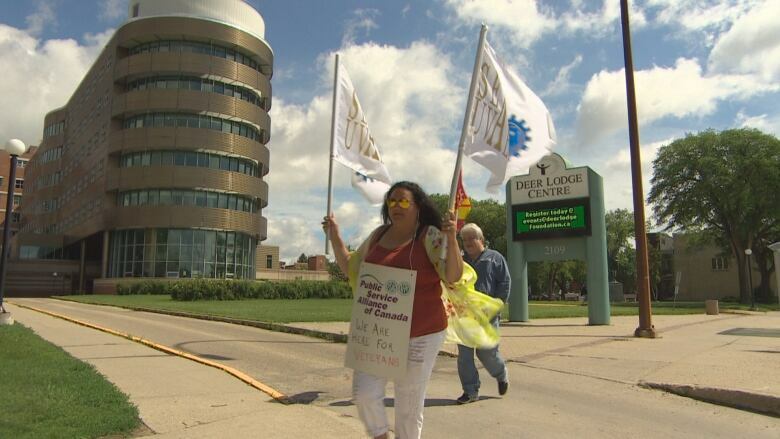 Deer Lodge employees and people from other unions — including the Manitoba Government and General Employees' Union, Canadian Union of Public Employees, United Food and Commercial Workers Union and the Manitoba Association of Health Care Professionals — marched together Tuesday carrying colourful flags. "We'd literally be pitted against each other and we'd have to fight each other for members that have already signed cards that already said we belong to this particular union. Literally it will become a fight," said Carl Gannom, UVAE's national president. He says the government's bill has created confusion among front-line health workers. "It's literally disrupting services," he said. "It's disrupting services to Manitobans, it's disrupting services to veterans, it's disrupting services in these facilities." In a press release, Health Minister Kelvin Goertzen said the changes found in Bill 29 will streamline bargaining units, simplify labour negotiations and align Manitoba with other provinces with far fewer collective agreements in health care. "This legislation will lead to a more flexible health system, and improve the quality and consistency of patient care across Manitoba," Goertzen said. However, Hladun says the unions' proposal to work together to establish units is a more harmonious solution that would accomplish the same goals if the government were to repeal the bill: "We're willing to work with them on a solution that will meet their needs as well as ours." A provincial spokesperson said a date is not yet set for when the changes will begin.